Aristotle’s definition of virtue is different from what people define it today. According to Aristotle, a virtuous life is the kind of life characterized by avoiding excesses and extremes of anything in life. He mentions some virtuous traits in the Nicomachean Ethics, which include courage, friendliness, liberality, honor and a few others. Aristotle using the extremes argument suggests that for example if one is extremely courageous it might lead to recklessness and if one is the opposite, it might be cowardice. Therefore, one must maintain a limit not to go below or beyond the needed amount and with the balance, comes a satisfaction which can only be interpreted as someone being happy. 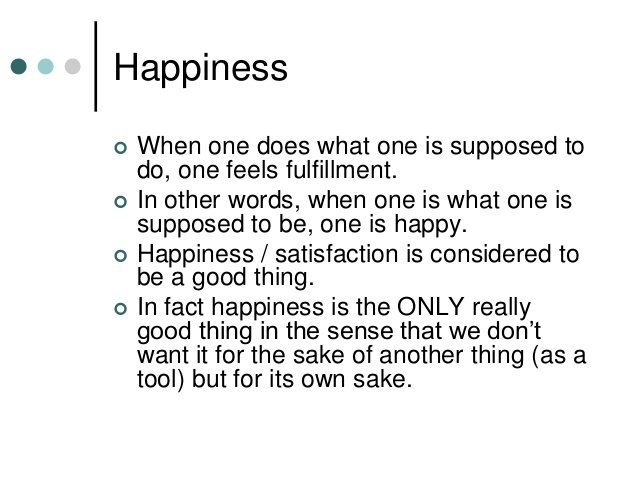 In my view, Aristotle’s argument about happiness is right. When doing any activity, it is only fun when it’s not in excess. For example, one might have a hobby in watching movies, the fun of watching is there when you watch them once in a while. But what happens if you watch consistently? If one spends most of their time watching, it can lead to addiction and in a way cause regrets to the person because they cannot stop. The same thing can be said about alcohol. Drinking alcohol is only fun when one gets to drink once in a while. However, if one partakes alcohol continuously, it could lead to addiction or better yet damage to vital organs in the body. People who obtain a balance of life, for example, divide their hours according to working, family time and alone time. They live more satisfying lives which in other words means happiness. Most people believe that going after something like getting a lot of money will make them happy while as those with money just want to slow down and enjoy their lives. People might be confused about the meaning of happiness, but in the midst of all the confusion they end up realizing that happiness is just a balance of everything in their lives. Not so many people know Aristotle’s view, but it is the only valid explanation of what happiness is.